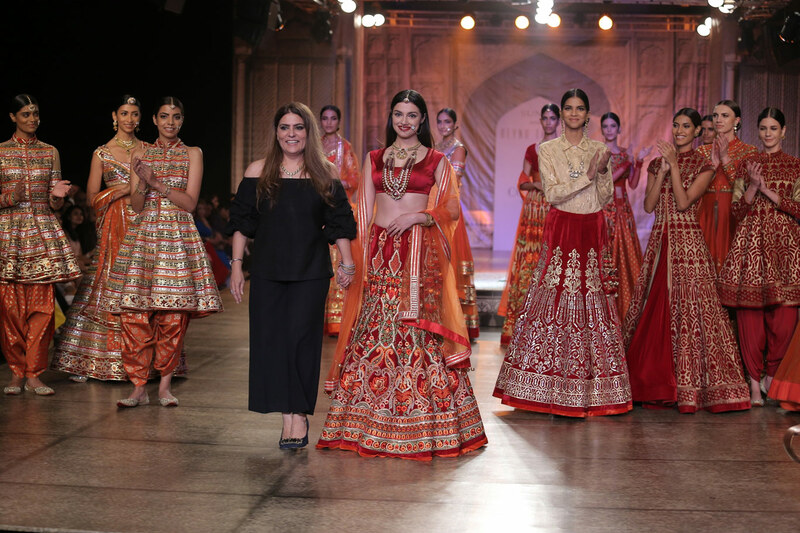 If red and orange are your bridal color picks, then you cannot miss Kamangari by Reynu Tandon. The collection was truly meant for brides and was highly inspired by Rajasthani traditions and tastes. The silhouettes reflected Rajasthani heritage with usage of foil paintings, block prints on khadi fabrics. The collection was all about redefining the traditional bride featuring the whole zari and gota tradition of the state in hues of red and gold. Divya Khosla turned a Rajasthani bride for designer Reynu Taandon’s couture show. The actress-turned-director wore a red-traditional lehenga-set which she accessorized with a Rajasthani borla. “It was very nostalgic for me as my first film ‘Ab Tumhare Hawale Watan Saathiyo’ also was set in Rajasthan. Even for my wedding I wore a borla. I love Reynu’s line. It reflects the new-age bride,” Divya said. Dress it down or team it up with some statement jewellery, and you can get away by choosing one of these outfits as your wedding outfit. I loved the colors, extremely traditional. But then, now that everyone else is running towards newer shades, suddenly the old is gold tune really rings true. Doesn’t it? Stunning, isn’t it? Be it front slit anarkali or a traditional looking floor length one…the designer just nailed it. Very hard to pick favorites, but I loved the red full work anarkali (the first one). Something about it just clicks. Which one is your favorite?